Medel Display Top blood pressure monitor is a fully automatic, digital blood-pressure measuring device for use on the upper arms, which enables very fast and reliable measurement of the systolic and diastolic blood-pressure as well as the pulse frequency by way of the oscillometric method of measuring. The device offers a very high and clinically tested measurement accuracy and has been designed by Medel in Italy, to provide the maximum user-friendliness. Measurement Range:- Pressure: 0 to 299 mmHg (0 ~ 39.9 kPa)- Pulse: 40 to 180 Pulses/min.- Pressure: ±3 mmHg (0.4 kPa). Accuracy:- Pulse: ±5% of reading- Pressure: ±3 mmHg (0.4 kPa). 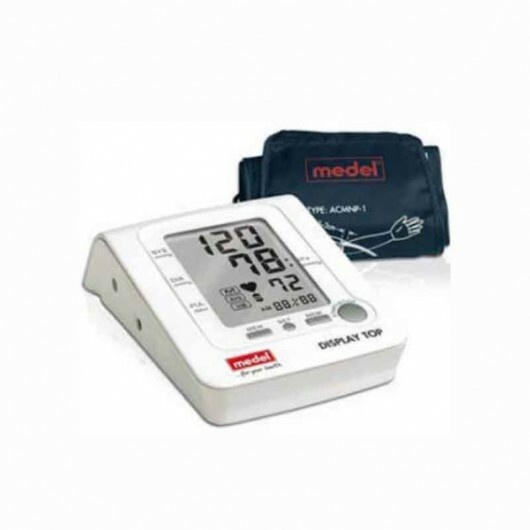 LCD Indication:- Pulse: ±5% of reading- Pressure: 3 Digits Display of mmHg /kPa- Pulse: 3 Digits Display.- Symbol: Memory/ Average/ IHB/ Heartbeat.- Low Battery, etc. Inflation: Automatic by Internal Pump. Deflation: Automatic by Air Valve. Rapid Air Release: Automatic by Air Valve. Memory Function: Memory 90 Sets of Measurement Values. Power Source: 4 AA Alkaline Batteries. Automatic Power-Off: In 2 Minutes. Operating Environment:- Temperature: +10C° ~ +40 C- Humidity: 15 ~ 90%RH (Noncondensing)- Barometric Pressure: 105 ~ 80 kPa. – Barometric Pressure: 105 ~ 80 kPa.